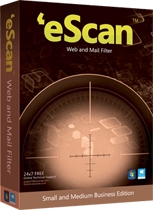 eScan Web and Mail Filter. MailScan for Mail Servers is an advanced Real-time Anti-Virus and Anti-Spam solution specially designed for Mail Servers. It ensures proactive protection to your organization’s network against Virus, Worm, Trojan and many other such evolving information security threats. Powered with an array of intelligent filters, MailScan offers powerful protection against Spam and Phishing mails along with comprehensive content security. MailScan ensured to scan all incoming and outgoing messages in real-time for offensive words and adult content, with the help of Security Policies. MailScan is powered with a combination of technologies such as Real-time Black List, SURBL Checking, MX/A DNS Record Verification, Reverse DNS, X-Spam Rules Check, Sender Policy Framework and Non Intrusive Learning Patterns through which spam and phishing emails are blocked. NILP is a revolutionary technology from MicroWorld that works on the principles of Artificial Intelligence, which employs an adaptive mechanism in Spam and Phishing Control. The antivirus and spam databases are automatically updated every hour for instant protection from emerging threats. MailScan comes with easy-to-use options to add customized disclaimers to all external and internal emails.